Taille de cet aperçu : 755 × 600 pixels. Autres résolutions : 302 × 240 pixels | 604 × 480 pixels | 967 × 768 pixels | 1 280 × 1 017 pixels | 2 191 × 1 741 pixels. A U.S. Navy Douglas SBD-3 Dauntless flies over the aircraft carriers USS Enterprise (CV-6), foreground, and USS Saratoga (CV-3) near Guadalcanal on 19 December 1942. The aircraft is likely on anti-submarine patrol. Saratoga is trailed by her plane guard destroyer. Another flight of three aircraft is visible near the Saratoga. The radar array on the Enterprise has been obscured by a wartime censor. Although from a commercial site that lists the source of this photo as William T. Barr, William Barr was a US Navy photographer (source: http://lcweb2.loc.gov/cocoon/vhp-stories/loc.natlib.afc2001001.10509/transcript?ID=sr0001) performing official duties for the US government which makes this and any other photo he took during this time original works of the US Government. Original works of the US Government are public domain documents. 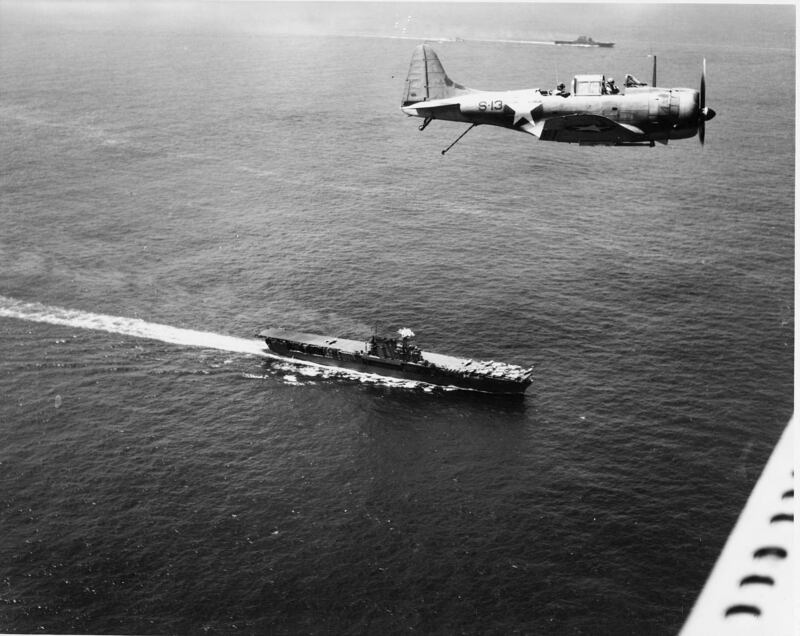 Ce document provient de « https://fr.wikipedia.org/wiki/Fichier:Douglas_SBD_flies_over_USS_Enterprise_(CV-6)_and_USS_Saratoga_(CV-3)_on_19_December_1942.jpg ».